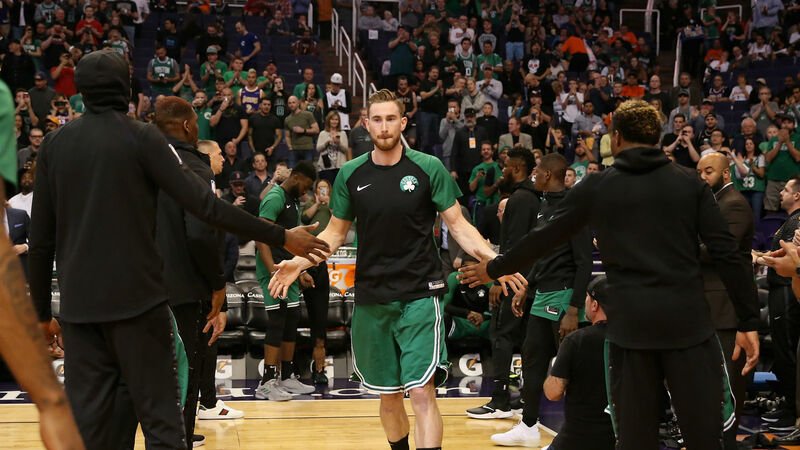 Boston Celtics forward Gordon Hayward expected to be booed on his return to Salt Lake City to face the Utah Jazz on Friday. After seven years with the Jazz, Hayward joined the Celtics in free agency ahead of the 2017-18 season, but a horrific ankle injury saw him miss all but five minutes of his debut season in Boston. The All-Star's first appearance at Vivint Smart Home Arena since departing was met with jeers – even prior to tip-off – and a chant of "we don't miss you". One Utah fan was seen wearing an old Hayward jersey with the nameplate replaced by 'Coward'. The 28-year-old was not surprised by the reception, but still enjoyed seeing some familiar faces around the 123-115 defeat. "I kind of expected some of that. It's part of the game. They were booing me from the get-go. It's part of the game," said Hayward. "Even in warm-ups, I didn't think they were going to boo, so that was kind of funny to me. But when you're in the game you're not worried about that. That kind of disappears. "I just tried to prepare for it like I prepare for every game. We're on a back-to-back so [there is] not that much time to think about it. I really just focused on some of our game-plan execution stuff, which we didn't end up doing that great. "It was fun [to be back], it was good to see just the people walking in, see some of the people around the arena, obviously the staff over there and some of the players. I wish we would've won the game, but it was good to see everybody." Hayward scored 13 points and supplied seven assists in the Celtics' third defeat in their past four games and coach Brad Stevens commended his professionalism in a tough situation. Stevens said: "I think one of the things that we knew coming in was that there was going to be a lot of emotion on their side and then their fans and everything else. "I thought he [Hayward] did a lot of good things and it's probably not the easiest position to be in, but I thought he handled it well from a playing standpoint."